From 0° vertical to 90° horizontal. Infini Winder can cut at an angle as wide as 90° and can continuously spin in one direction infinitely. There are no cables to wrap up. WARDJet’s unique design for 5-Axis cutting allows for 500,000 encoder counts per revolution for the A and C motors respectively, ensuring the unit can conservatively achieve accuracies of ± 1 arc minute, backlash free motion, with a torque of 39Nm or 345 in-lbs, easily outstripping the competition. 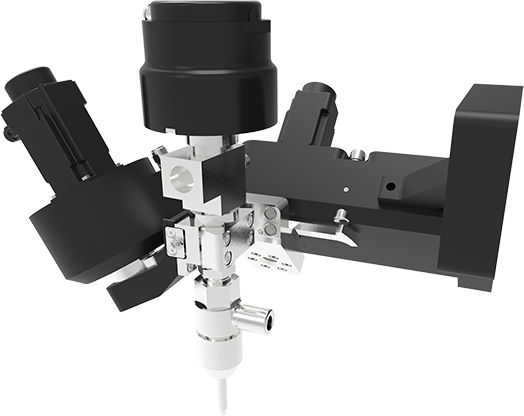 WARDJet utilizes 2 harmonic drive actuators, commonly used in precision robotic applications, to ensure that the Infini Winder is a highly accurate and extremely reliable 5-Axis mechanism that meets WARDJet’s stringent requirements. WARDJet directly couples their tilting axis mechanism to the harmonic drive output flange and the rock-solid crossed roller bearing. The unparalleled backlash characteristics of the harmonic drive mechanism eliminate the slop and play inherent to other designs. Did you get that? Almost? Let's recap - The Infini Winder is engineered to be substantially more accurate than any other 5-Axis cutting head in the industry. Minimize or even eliminate taper with the WARDJet TC-8 5-Axis cutting head. 5-Axis cutting opens up a wide range of applications that can be done on waterjet. As it is still a relatively new technology, from a business standpoint, the profit margins from this type of work can be very attractive. Below is a comparison chart of the WARDJet Infini Winder 5-Axis cutting head, versus claims and statements of our competition. All competitor's details and statements quoted are on the internet or available to the general public. Competitor A "...provides for up to 60 degrees of motion giving you the ultimate in accuracy, speed, and flexibility." Cut up to 90 degrees with the Infini Winder to give you full 3-dimensional capabilities. Up to 50% more cutting envelope than the competitors! Competitor B "...is capable of a positioning accuracy of ± 0.09 degrees (± 6 arc minutes), making the accessory the most accurate articulated cutting jet of its kind in the industry. " (± 1 arc minute) Substantialy more accurate than the competitor! Competitor C No claims or advertised specifications other than cut speed up to 400ipm which does not pertain to 5-Axis cutting. Competitor D "...is capable of positioning accuracy to 0.2 degrees (± 12 arc minutes) with rapid acceleration and positioning speeds, making it the fastest, most accurate 5-Axis waterjet cutting head available in abrasive waterjet cutting." (± 1 arc minute) Substantialy more accurate than the competitor!